The steep descent over loose sand into dull waters offers little resemblance to the pristine shore depicted on posters at the pier, which promise visitors to the Southern Islands a barren beach suited mainly for baking bodies. Devotees of nature in a state of sterile unreality will be disappointed to find a muddy foreshore of trickling tidal streams and an infinitude of surprises on Pulau Subar Laut. For the corals that once retreated to the farther reaches have returned with a gentle vengeance, creeping in through the sea wall to battle smothering waves of sand and rebuild colonies that are becoming more reef than rubble. Resembling a motley assembly of grey shapes and coarse sticks to the superficial observer, the corals betray their true colours to stumblers who stoop low enough to see the polyps for the rocklike mass that forms their basal skeleton. Some sprout like little bushes of branching arms riddled with rosettes of corallites. 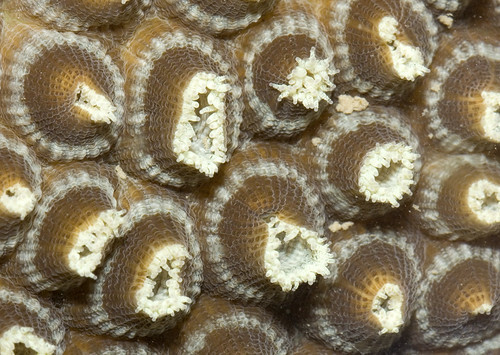 Others assume the guise of boulders, brains and tabletops, who unveil their living tissue of sticky tentacles in the safety of the night to feed on suspended plankton. 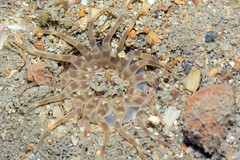 Most of the individual animals are minute, smaller than even the blobby zooanthids that grow in soft and slimey clusters on mud and sand. 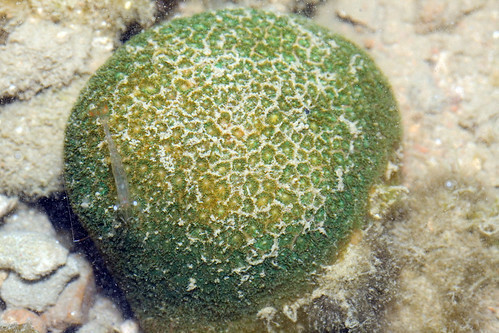 But one family, Fungiidae, has in part abandoned the sedentary life, starting life as a domed disc on a stalk to earn the moniker of mushroom corals, but losing the attachment to wander about as free-spirited polyps the size of a dinner plate. 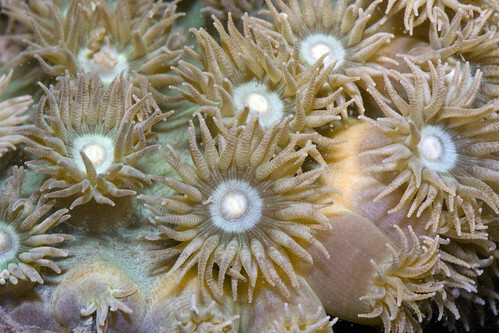 Capable of locomotion at speeds slower than the eye can see, these corals occur at pleasant densities in the lagoon, where brocades of colourful tentacles protrude from the grooves between stiff septa that seem to enjoy the company of fellow filter feeders. The macaques that live marooned on this island and its swirling whirlpools are silent in the dark. While they sleep, columns of termites fan across the footpath in search of fibrous fodder for their cities in the soil. The litter palms and coastal trees is untouched by cleaners here, and fester in a glorious mess that attracts a beachhead of flies, sandhoppers and hermit crabs that gather to feast on fallen fruit and fertilise the shore with their fresh droppings and dead bodies. There is a perpetual exchange of energy in this shared zone of two worlds, as the denizens of each realm probe their outer limits of tolerance to dine on stranded sea creatures or harvest a terrestrial bounty. 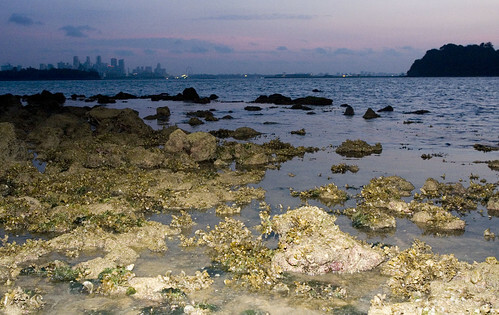 Borrowing the shells of departed snails, land hermits play on the foreshore, foraging close to their fellow crabs to boost the chances of a common windfall. 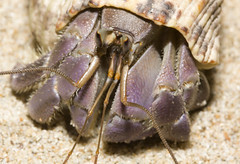 Some are known to use the coils of African land snails for shelter, but those here are happy with the compact marbles of nerites and turban shells. Some are unconcerned with our approach, while others curl up behind the armoured aperture of their primary claw. Left alone, they emerge warily, waving two pairs of sensitive antennae and two eyes on short stalks. But poking fingers are fair prey for an unmitigated pinch on pink skin. 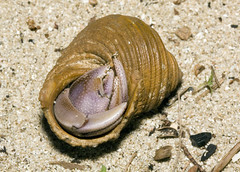 Other much tinier hermit crabs prowl in hordes in the veneer of water that laps the edge of the land. Clusters of rubble form miniature barrages that embrace deeper pools where nervous schools of fish scatter with noisy fright. Tiny shrimp, amphipods and shallow water swimmers with biramous legs cloud the depressions with their barely-visible bodies. Each individual, blessed with a heightened sensitivity to its surroundings and status as a tasty snack, wagers its life day and night for the chance to feed and mate. For the rocks and grains they tread hide unbenign neighbours, from the business end of nemertean worms to pits with a sweet sixteen of stinging arms. 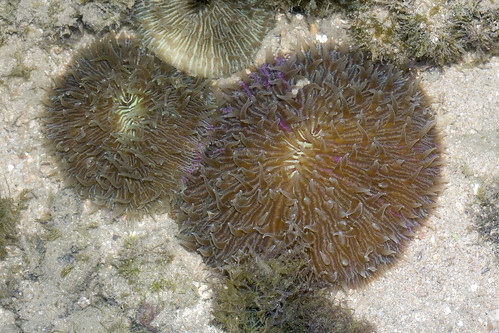 With long columns secured in a foot of sand against wave action and wild-eyed collectors, these anemones find their way to shore by hitching a ride on jellyfish that are devoured alive as they drift to dry by the high water mark. Abandoning their host, the actinarians burrow into the substrate and begin life anew as settled hunters who must endure the trampling soles of flat-footed walkers in search of fun in the sun..